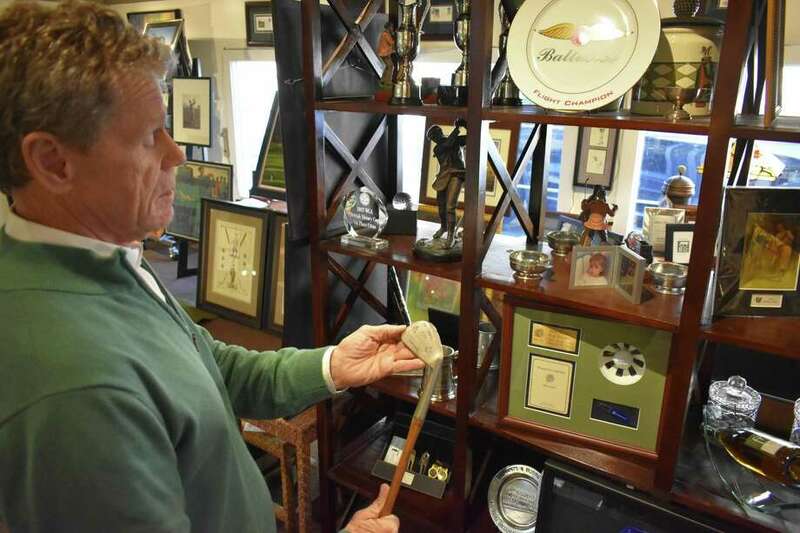 Golf Art owner Skip Rooney in February 2019 with a vintage golf club, part of an extensive collection for sale of prints and artifacts for sale at the Ridgefield, Conn. shop. After 30 years in business, Golf Art is holding its first-ever inventory sale at up to half off — including items that have never been on sale — to clear space for a collection of thousands of vintage magazines the shop’s owner purchased recently and has begun framing for sale. The personalities range from the game’s greats like Ben Hogan, Bobby Jones, and Arnold Palmer, to depictions of women golfers on the covers of Colliers, Life, The Saturday Evening Post and other publications both renowned and obscure. Skip Rooney, owner of Golf Art, created the predecessor business in Wilton in 1986, operating out of a kiosk that still remains at the junction of Danbury and Ridgefield roads. Originally selling artistic prints, he fielded a query one day from the then-general manager of Woodway Country Club in Darien looking for golf-related items. While conducting a search, he came to learn of the demand for prints by golf clubs. He began making the rounds locally and found enough interest to pivot the print business to focus on the game. To build broader awareness, he took to the road, including trips to the British Open where he presented clubs with free framed lithographs depicting Bobby Jones, with an accompanying business card. The Golf Art name would start making the rounds among clubs in the United States and abroad. Rooney said the best-selling items today are lithograph prints of the great courses, particularly Augusta National and Pebble Beach. From there, the business expanded to include awards for golf tournaments and corporate events, including keepsakes linked to the U.S. Open, and in time standard framing services. Golf Art has been located more than 20 years at 609 Ethan Allen Highway in Ridgefield on Route 7, a derelict building when Rooney first laid eyes on it. After stepping through a broken window frame accompanied by a real estate broker, he fixed it up. The building was badly damaged in a 2011 fire that destroyed some of Golf Art’s inventory. A Great Depression golf club set remains the most unusual item Golf Art has ever sold in Rooney’s estimation, acquiring a set of clubs from the 1930s that were inscribed with the name John D. Rockefeller. Rooney believes they were the property of the Standard Oil tycoon, with a buyer eventually purchasing them for more than $1,100. Golf Art continues to stock antique clubs, with shafts of hickory and other wood as well as steel with a finish to emulate wood for aesthetic purposes. His favorite piece in the shop now is a Life cover of Hogan from the 1950s, which Rooney framed with a separate Hogan autograph in his collection. The piece hangs on Golf Art’s wall, but plenty more is cramming the store’s floor as the sale kicks off Tuesday, running through March 16, with information online at www.golf-art.com or by calling 800-283-3344.